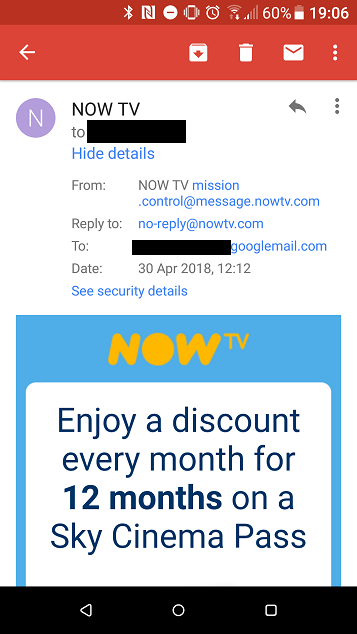 So recently someone signed up for a NOW TV. They used, either accidentally, or on purpose, one of the aliases from my google email address. For those who don’t know, google takes email addresses like one.two@gmail.com and also gives you the aliases onetwo@gmail.com, one.two@googlemail.com and a few others. This seems great, except you can’t actually send an email from them, that I know of. Anyway, someone used one of the aliases of my account to sign up for NOW TV. I tried emailing NOW TV to let them know, but they didn’t respond. So I ignored it and eventually their systems auto-cancelled the application. All good, you’d think. Until I started getting spam from NOW TV to that alias. So I fire up an email to ask nicely if they could remove my email address (expecting the usual “email us from that email address to confirm, please”, which is another issue). Here’s how that case is going – I emailed asking if they could remove my email address from their list, explaining exactly what had happened so far and about the google aliases…. Thanks for contacting NOW TV. I understand and I’ll try my best to help you on this. I have checked with the given email address and seems there is no account linked – email.address@gmail.com. To check and help you further, I will need few details to access your account. Can you give me the first line of your address and postcode? The last four digits of the payment card registered to your account please? Yes, the problem with this is that gmail uses aliases emailaddress@googlemail.com, email.address@googlemail.com, email.address@gmail.com, emailaddress@gmail.com are all aliases of my account. One of these was used to create account xxxxxxxxx, which may or may not have been cancelled/inactivated at this stage – I don’t know, it wasn’t my account in the first place. However now I’m getting spam via the email alias that someone else used without my permission. I can understand how much important this is for you. Please help me with your full name and email address to which you have NOW TV Account registered? Last four digits of the payment card on which you have been charged. Hmm, you’re not getting this are you, NOW TV? And I’m getting a different responder every time. I can see I’m in for the long haul…. Hmm I don’t think you’re actually reading my email. I don’t have an account, I never did. Someone used my email alias to sign up. I hope you’re doing good today. I request you to please check with your family members and friends if they have used your email address to create an account and let us know about the same. They have not. And they would not use that email alias, as I’ve never given it out. Sorry for the previous probing email that was sent in error. However; please could you help me with the screenshot of any one of the marketing email that you are fetching by us with the dates ,mentioned on it so that we can get this checked further. We know the feeling when something like this happens. To be honest we would not want this to happen with anyone. 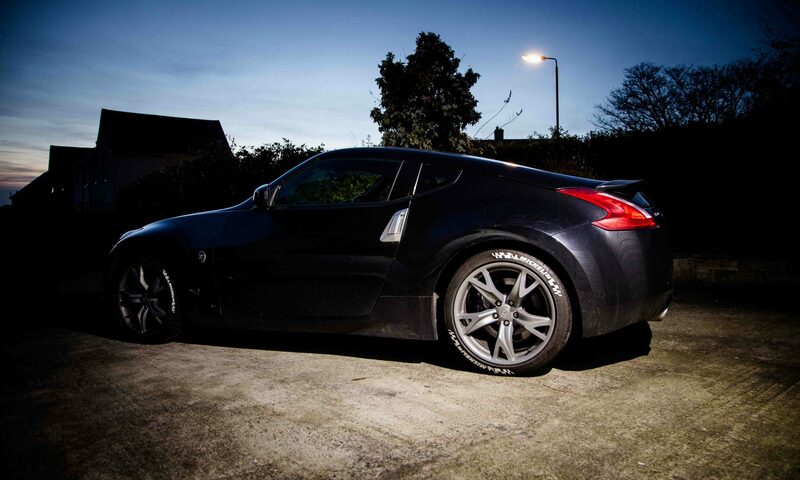 However,would request you to contact bank and stop payments so that no further payments are taken. I understand how it feels if something like this happens. I too would not like to face a similar situation as it relates to your hard earned money. We tried locating your account with the details you provided sadly we are unable to locate such account with the charges you mentioned. Hence we request you to please get in touch with your bank and stop any further payments to NOW TV. And so the saga of wasting my time continues! I’ll update with more as it comes in! Clearly this is an auto-reply system. KIRTI -: Thanks for contacting NOW TV, you are talking to KIRTI. Can I start by taking your full name and email address, please? KIRTI -: I understand your concern. Don’t worry I’ll try my best to sort it for yo. KIRTI -: Sorry for the typo error. KIRTI -: I totally get it and I want to help you further. Can you give me the first line of your address and postcode, and the last four digits of the payment card registered to your account please? KIRTI -: Are we connected? KIRTI -: I get it, but i need to check it so that I may remove all your details. KIRTI -: Can you tell me whether you were charged and if yes how much amount was it? null -: It’s not my job but….have you even read my emails? null -: Let’s walk through this. null -: 4) I contact you to remove it, and you won’t without all my details, which you don’t have anyway and I won’t be giving you. KIRTI -: Please give me moment. KIRTI -: I will make sure your issue is sorted today. KIRTI -: Can you help me with your full name please? KIRTI -: Just a couple of more questions to access the account xxxx. KIRTI -: Yes, but I need your full address postcode and the last four digits of the card to access the account please. KIRTI -: Help me with all possible address, let me check. KIRTI -: Believe me xxxx, I’m trying my best to get this sorted right away. KIRTI -: Our customer’s details are very secure with us. KIRTI -: I haven’t heard back from you, if you still need help please let me know otherwise I’ll have to end our chat.